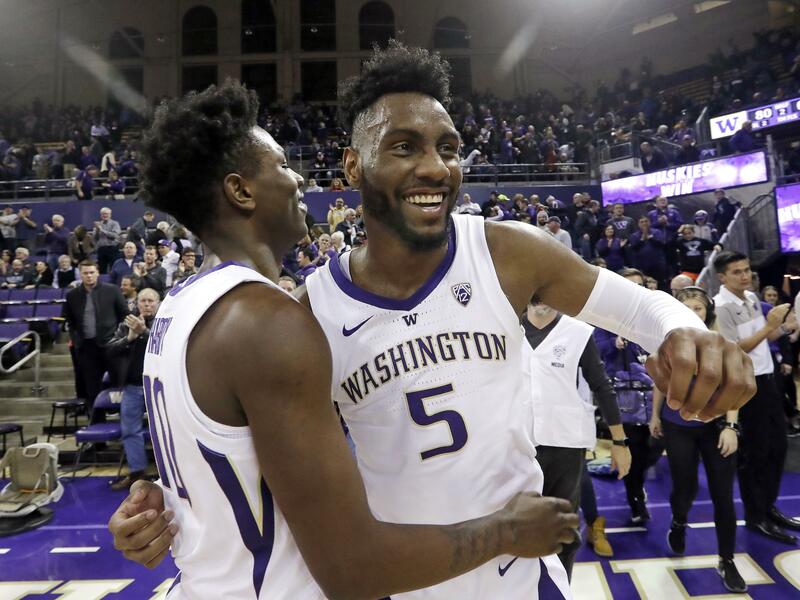 SEATTLE – You can call Jaylen Nowell a lot of things, but self-promoter isn’t one of them. He doesn’t tweet often, hasn’t posted on Instagram in more than a month, and conducts himself with humility at every news conference. So he isn’t going to be the guy to tell you how well he’s been playing in his sophomore season with the Huskies. But somebody has to. Through 17 games, Nowell is averaging a team-high 17.0 points and 3.4 assists to go along with his 5.2 rebounds per game. He scored 32 points against Santa Clara at the beginning of the season, and then 26 against Gonzaga last month en route to earning Pac-12 Player of the Week honors. But it’s not just about the numbers Nowell is producing – it’s the manner in which he’s producing them. Any fat he had in his game last season has melted right off. Washington coach Mike Hopkins has long preached his “good to great” strategy when it comes to shot selection. Basically, don’t settle for a shot you can make half the time if you can find one you or a teammate will make 55 percent of the time. Those increased probabilities, however slight, can mean the difference between wins and losses. And nobody has embodied that approach better than Nowell this season. Last year, the Garfield High graduate averaged 16.0 points while shooting .451 from the field (.484 from 2-point range and .351 from 3.) This year he is averaging 17.0 while shooting .515 from the field (.535 from 2 and .400 from 3). His 12.9 shot attempts per game are 0.3 fewer than that of his freshman season, but his 6.6 makes are 0.6 more. What’s interesting is that one of the strongest weapons in Nowell’s arsenal is something stat geeks are trying to erase – the midrange jumper. Look at most shot chart these days and you’ll mainly see 3-pointers and layups. Even players such as Kobe Bryant and Michael Jordan shot under 50 percent from midrange throughout their careers, but Nowell’s midrange game has been devastating. His 2-point percentage is proof of that. For players that have made at least five field goals per game, the most efficient 2-point shooter in the Pac-12 this season has been Washington State’s 6-foot-9 Robert Franks (.690), followed by UCLA’s 7-1 Moses Brown (. 677) and Arizona’s 6-10 Chase Jeter (.625). Neither Brown nor Jeter have attempted a 3-pointer this season. Those are the types of players who typically lead that category, and they rarely stray from the rim. But No. 4 in the Pac-12 is the 6-4 Nowell (.555), who’s all over the court. Throw in the fact that he’s eighth in the conference in 3-point percentage and you have quite the asset. NBAdraft.net has Nowell going early in the second round of the 2020 draft, but that doesn’t mean anything. The concern now is Saturday’s home game against California, in which the Huskies (13-4, 4-0 in the Pac-12) will look to win their seventh game in a row. Will they do it? Nobody knows for sure. But they have a good shot with Jaylen. Published: Jan. 18, 2019, 4:10 p.m. Updated: Jan. 18, 2019, 9:01 p.m.